I am incredibly grateful for the opportunity to minister to the men sheltered at the Union Gospel Mission Dallas on the 4th Friday of every month. Every month, our team of volunteers gladly give of their time, treasure, and talents to give hope to the lost, the last, the least, and the lonely. The Union Gospel Mission began as a street ministry in 1949 when a group of Christian businessmen took to the streets of Dallas, telling the poor about God’s love for them. Each year, hundreds of men enter UGMD’s long-term, faith-based recovery program. Each year the Union Gospel Mission provides 127,482+ nights of shelter, cooks 410,738 meals, helps 4500 people, and serves over 400 veterans. Through the nightly chapel services, hundreds of men come to know Jesus as their Lord and Savior and receive the gift of eternal salvation throughout the year. The mission’s discipleship program is designed to help people end their personal struggles with homelessness, first by establishing and nurturing a relationship with Jesus Christ, then by learning the skills necessary to re-enter society and live an independent life. This process includes graduating from the Mission’s Learning Center, obtaining a job and, in the final phase, living in a transitional living facility. Prior to graduation from the program, each disciple must be involved with a local church, have a savings account, hold a job and be living independently. The Discipleship Program is self-paced, and usually takes between eighteen months and two years to complete (UGM, 2018). Each time we journey down to the shelter, our team is blessed. Ministering to someone else seems to always return with even greater blessing on those sharing the love of Jesus with those in need. There is a lot of talk about how to solve homelessness. I’m not sure we will ever eradicate it from our midst. There is just as much talk about what causes homelessness, including attempts to blame the poor for being poor. At the end of the day, our mission focuses on having a conversation about the One we know who transforms lives. A change of heart and a transformation of the mind must occur, otherwise you can build all the houses you want only to find yourself back at square one. Yes, affordable housing is certainly part of the solution. But so are changes in decision-making, problem solving, and overcoming hurts, habits, and hang-ups. Even so, those living on the marginalized edge can easily fall prey to a freak event of nature or devastating medical issue that they are unable to overcome. When a tornado or hurricane wipes out your home, it’s not a matter of character, but circumstance. If an unexpected onslaught of medical bills override your ability to keep your head above water, it’s not an indictment of your decision-making, but a result of a tidal wave of overpowering events that leave you, and your family, devastated. Romans 12:1-2 Therefore, I urge you, brothers and sisters, in view of God’s mercy, to offer your bodies as a living sacrifice, holy and pleasing to God-this is your true and proper worship. Do not conform to the pattern of this world, but be transformed by the renewing of your mind. Then you will be able to test and approve what God’s will is-his good, pleasing and perfect will. Trust me. No one grew up wanting to be homeless. Sure, there can be other problems. Like our veterans unable to cope with life after war due to PTSD and not having the resources available to them to provide the help they desperately need. Think about it–someone went off to war so we could continue enjoying our freedoms only to return and be without a home. That’s not on them. That’s on us. And yes, there are many who struggle with addiction and who struggle with issues of character. So do many of us. Yet, we aren’t homeless. Not because we are smarter or stronger, but because our support system is better. And, truthfully, simply because of God’s grace. Ephesians 2:8 For it is by grace you have been saved, through faith-and this is not from yourselves, it is the gift of God. When go down to the shelter, we don’t attempt to solve every problem and we certainly aren’t under any illusion that we will solve homelessness or eliminate the scourge of poverty. The poor, Scripture teaches us, have always been with us. No, when we go we focus on providing love, hope, and faith to the 300+ men we meet every month at the shelter. We seek to suspend the noise of the world and exchange it for the sounds of worship as we sing songs exalting an almighty, all-powerful God. We strive to feed their souls through sharing the Word of God, reassuring them they are neither forgotten nor forsaken. 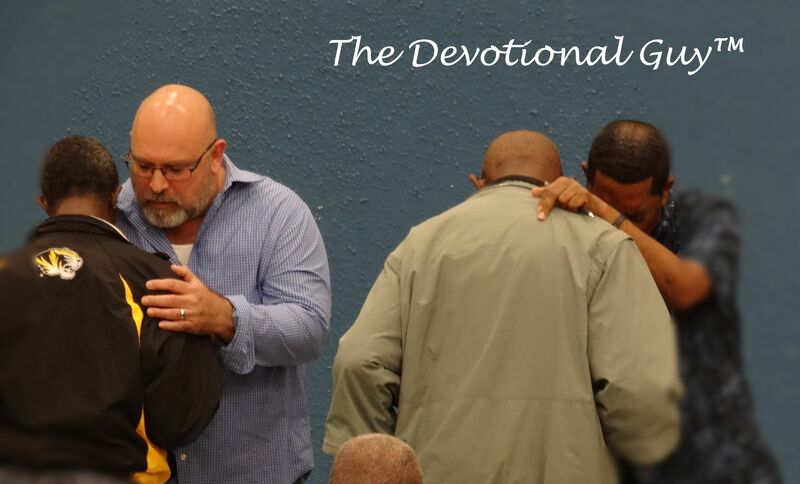 We attempt to cover them in prayer, ending each service with intentional, one-on-one prayer. Many of the men come forward to express their needs and lay their burdens at God’s feet. Occasionally, the Spirit moves in the hearts of certain men to receive Jesus and accept Him as their Lord and Savior. O, what a glorious moment that is! Our team of sojourners loves these men and witnessing the work the Lord is doing in their lives. Through it all, we try to be ourselves, genuine and authentic, cherishing every moment that we get to spend sharing the Good News with the men of Union Gospel Mission Dallas. What a privilege! What a joy! You can learn more about the work being done at Union Gospel Mission here.